In the video below, I provide a short demonstration so you can see what's inside the Scentsy Party in a Box! Basically, a Party in a Box is Catalog Party and it enables you to host a party and earn rewards without having a traditional home party. Please keep in mind, the party contents are continually changing and not all parties will receive the exact same contents as shown in the video. Learn More about Hosting a Scentsy Party in a Box? 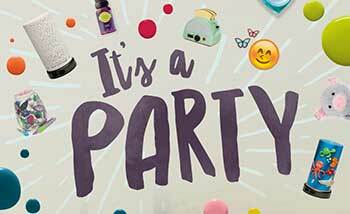 Scentsy Fragrance Wickless Candles are more popular than ever, and many people like to host parties while earning the host rewards! If you love Scentsy and would like to host a party, but don't want to host a home party, you could host a Scentsy party in a box. You still have the exact same opportunity to earn the host or hostess rewards, but no one comes to your home. We ship you the party box, you share the products, take the orders, and we process them. After a week or two, you send or e mail us the completed order forms and we process the orders. Once you're done with your "Party in a Box" you send it back to us or pass it on to someone else, so you earn an additional half off reward! Sharing the Scentsy products is fun, simple, and a great way to earn free and discounted products. Get started by completing the form below. Please choose your preferred party start date. Every effort will be made to accommodate your request. Please provide any additional information about your party. Contact Us to Arrange Shipping for Your Party in a Box! You may also call or text Mary Gregory at 661-210-7617. Unfortunately, we just can't trust everyone, so you must contact Mary directly to make appropriate arrangements, provide credit card info and a refundable deposit, before we ship your party. Contact us today! Scentsy Independent Director Mary Gregory will ship you a "Party in a Box." The box contains the scent testers so you and your friends can test all the authentic Scentsy fragrances. You also receive the catalogs, order forms, a sample warmer and/or a scented wax Scentsy Bar. Fill out the interest form below and Mary will get your party box in the mail almost immediately. Earn FREE PRODUCTS equal to 10 to 15% of your party’s sales. Get an additional HALF-PRICED product when any of your guests hosts a party and you attend. When you're done with your party, try to pass the "Party in a Box" on to someone else. That way, you don't have to send it back and you earn one extra 1/2 off perpetual reward. Enter first and last name. Be Notified of Specials and Sales!